Spot ethylene prices in Asia and Europe have been sustaining their downturn since the second half of August amid ample supply and thin buying interest. On the other hand, the US markets have seen prices mostly stable due to limited activity. The spot ethylene market in Europe posted significant declines last week. Data from ChemOrbis Price Wizard suggest that the weekly average of spot prices on an FD NWE basis hit its lowest level since January 2017. The recent decline was largely the result of the oversupply amid low water levels on the river Rhine, which are impeding barge shipments. Similarly, ethylene prices in Asia were down to their lowest levels since August 2017, on account of poor demand amid rising inventories ahead of the year-end as well as weaker downstream markets. The weekly average of spot ethylene prices on CFR Far East Asia basis has shed $310/ton, or more than 22%, since the beginning of the downtrend in late August. On the production side, Lotte Chemical is expected to restart its cracker following a 40-day turnaround later this month while South Korea’s YNCC and LG Chem are readying to resume operations at their ethylene plants next month. 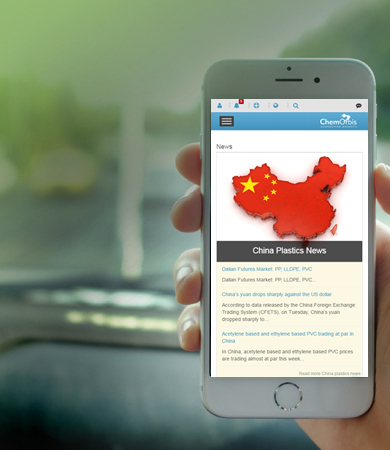 The Chinese SECCO’s cracker is also among the plants scheduled to return in November. 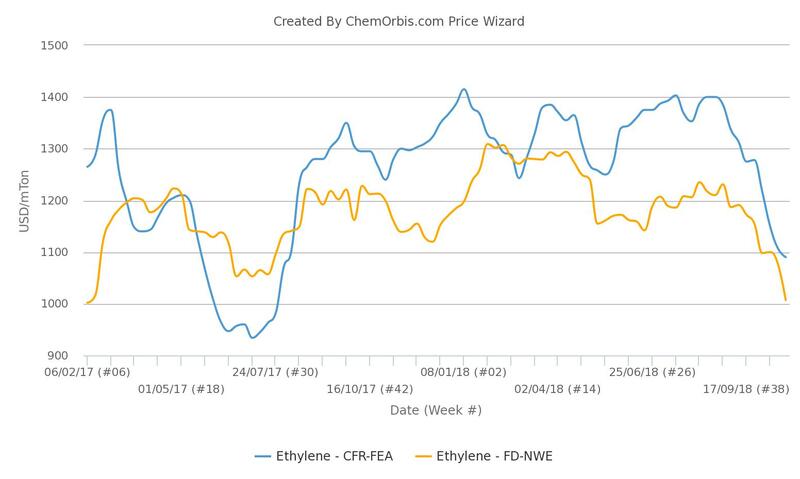 Meanwhile, spot ethylene prices in the US were stable for the past two weeks after a short-lived softening that followed a rising trend for almost three months. Trade was thin in the midst of expectations that there might be ample supply as the year end approaches, with Sasol’s new ethane cracker almost ready to start-up in Lake Charles, Louisiana. Although ethylene ended the week flat in the US, ethane prices tracked the downward movements in crude oil pricing and moved lower after reaching multi-year highs in September. Data from ChemOrbis Price Wizard show that the weekly average WTI crude oil price fell by around $5/barrel to the $70/barrel level since the downward trend kicked off three weeks ago.